Dutch Filmworks, a large movie distributor based in the Netherlands, has successfully registered the logo and word trademarks for Popcorn Time. The company used Popcorn Time's official logo for the application. Dutch Filmworks' doesn't plan to actively enforce the trademarks, but says they may play a role in future anti-piracy efforts. In little more than a year Popcorn Time has amassed millions of users by offering BitTorrent-powered streaming in an easy-to-use Netflix-style interface. The term Popcorn Time itself has also become a widely recognizable “brand,” something that hasn’t gone unnoticed in the movie industry. Various copyright holders and anti-piracy groups have targeted Popcorn Time, with varying success. However, a new effort from film distributor Dutch Filmworks tops them all. 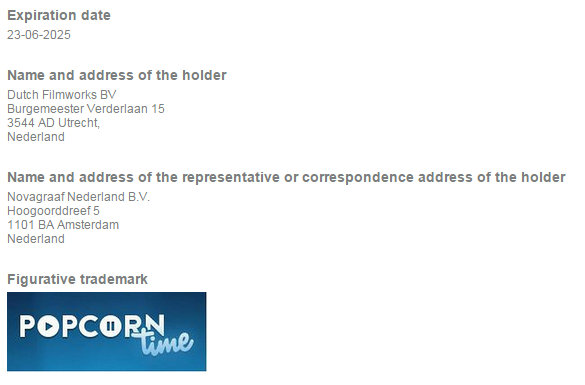 This June, Dutch Filmworks applied for Popcorn Time’s logo and word trademarks at the Benelux Office for Intellectual Property, which officially approved the registration last month. This means that the film distributor now owns the trademark to the term “Popcorn Time” in various categories including software, as well as the official logo pictured below. An interesting move in a number of ways, not least since the logo wasn’t created by the company but by Popcorn Time’s developers. Also, the trademark application itself was submitted long after the application became known to the public. The developers of the popular PopcornTime.io fork inform TorrentFreak that they are aware of the issue but choose not to do anything about it at the moment. In addition, they also highlight that Dutch Filmworks claim on the trademarks is rather dubious. Nevertheless, the developers don’t see the trademarks as an immediate threat to their software. “For the most part, we are not worried. We are curious about what they think they’re doing though,” the Popcorn Time team notes. A spokesperson for Dutch Filmworks informs TorrentFreak that they have no plans to actively enforce the trademarks – yet. “We registered the Popcorn Time trademarks for the Benelux. Mainly because, to our surprise, it hadn’t been done by Popcorn Time itself,” Dutch Filmworks’ spokesperson says. Needless to say, this is quite an innovative approach. Time will tell whether the trademarks will indeed help to stop the distribution of Popcorn Time in the future. There’s also a separate Popcorn Time trademark application at U.S. Patent and Trademark Office. This was requested last year by the developers of the aforementioned fork and is still pending. c There are 135 comments. Add yours?